"Definite crowd pleaser! This is THE pasta salad. Super easy to make. Ingredients are easy to keep on hand. Recipe is very easily doubled. It has become my signature side dish for barbecues." Bring a large pot of lightly salted water to a boil; cook the rotini at a boil until tender yet firm to the bite, about 8 minutes; drain. Rinse pasta with cold water until chilled; drain. 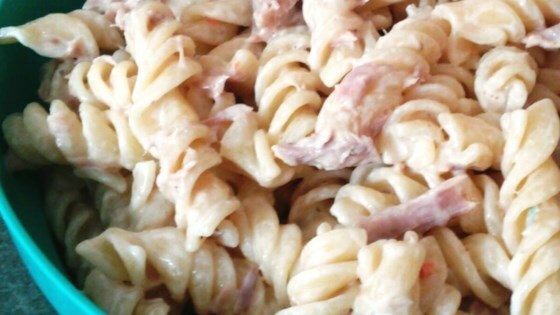 Mix pasta and salad dressing in a large bowl; fold tuna into the pasta mixture. Cover bowl with plastic wrap and refrigerate until the salad is cold, at least 1/2 hour. Optional: add sliced grape tomatoes or vegetables of your choice. This is a good easy recipe. I added some California mix veggies and thinly sliced onion. Can also use low fat Italian dressing. I also made this with ham and/or chicken. Good and easy recipe. The only thing I added was cut up grape tomatoes.